This past week was an especially generous one mail-wise. I overdid it with book blogging holiday swaps this year, but it's been such a joy finding bookish goodies in my mailbox, especially since I am no longer accepting review books and rarely buy any books for myself these days. I have had such fun selecting books for other people as well--sometimes adding new titles to my wish list. One of the swaps I couldn't resist joining in on was the Booklovers Secret Santa 2010 in which participants were to give a book or two to their Santees. 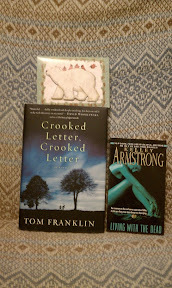 My Secret Santa, Lizzy from Cornucopia of Reviews, made my holiday with books that were at the top of my wish list: Crooked Letter, Crooked Letter by Tom Franklin and Kelley Armstrong's Living With the Dead (and don't you just love that polar bear card?). You should have heard my little squeal upon opening the package and finding what was inside. There's nothing better than finding books in the mail! Many thanks to Lizzy for the great books and Kate from The Neverending Shelf for hosting the swap! 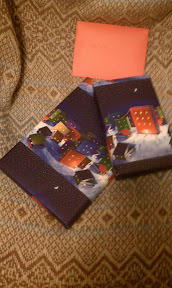 And of course I had to join the Book Blogger's Holiday Swap again this year! 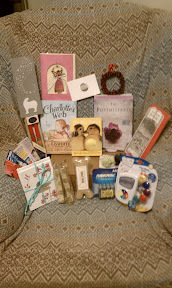 Jill of Rhapsody in Books Weblog spoiled not only me, but my dog, cats and the baby too. My husband even got a little something (I couldn't eat the Biscotti cookies all by myself, after all)! Included in the package were candles, a pin that says "I'm not to be trusted in a bookstore with a credit card" (how true is that?! ), beautiful note cards, cat toys, a bone for the dog, Biscotti cookies, a Baby Einstein Take Along Tunes (& batteries), bookmarks, and an ornament for the tree. And no book blogger holiday swap would be complete without books! Jill gave me a copy of Charlotte's Web by E.B. White, one of my childhood favorites, along with The Postmistress by Sarah Blake, a book I've been wanting to read since it first came out. She also included a book called On the Farm, a cute little book the baby will certainly enjoy not only hearing, learning to read, but touching too! Thanks so much, Jill! 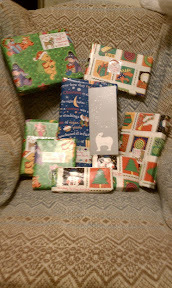 And thank you also to the hosts of the Book Blogger's Holiday Swap! Did you participate in any book blogger gift exchanges this year? Are you getting anyone books for the holidays? Oh! And please do check out Jill's (Rhapsody in Books Weblog) and Lizzy's (Cornucopia of Reviews) blogs if you haven't already. They both write quality reviews and have great taste in books! What wonderful gifts! I'm reading CL, CL right now (it's good). Enjoy all the books and fun gifts. What great gifts! And you definitely won the secret santa lottery with Jill. Who did you have to bribe to get her???? Just kidding. YOu deserve all of this! Way jealous on Crooked Letter! What a great set of gifts! So many nice items in there, and I bet you are going to love every one! Christmas came early for you! Enjoy your new treasures! What fun packages to receive in the mail! Wow, you have certainly done well in the swaps this year! What fantastic gifts. Enjoy Wendy - you deserve them all! What thoughtful gifts - especially Jill's package, keeping the whole family in mind:-). Enjoy! Those are such wonderful gifts Wendy!! What a thoughtful assortment of books and gifts! Enjoy! I do agree with you, Wendy. Book bloggers give the best gifts! Enjoy yours!